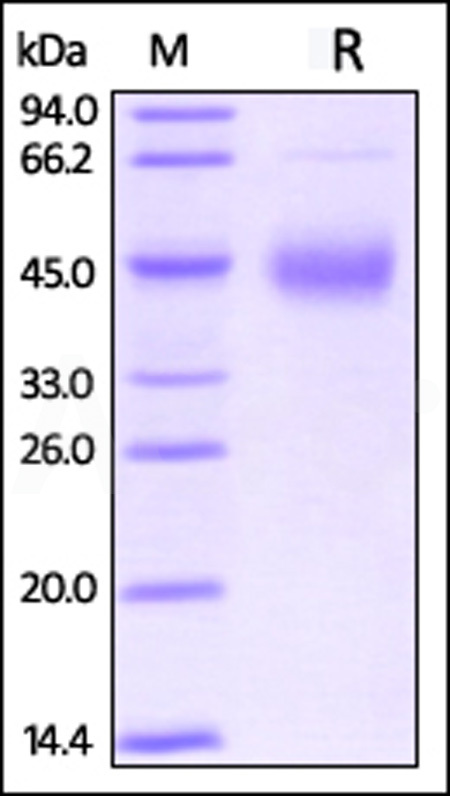 MABSol® Biotinylated Human TFPI (TFI-H8226) is expressed from human HEK293 cells. It contains AA Asp 29 - Lys 282 (Accession # NP_006278.1). It is the biotinylated form of Human TFPI protein, His Tag (Cat # TFI-H5226). This protein carries a polyhistidine tag at the C-terminus. The protein has a calculated MW of 30 kDa. The protein migrates as 41-45 kDa on a SDS-PAGE gel under reducing (R) condition due to glycosylation. The biotin to protein ratio is 2-3 as determined by the HABA assay. Biotinylated Human TFPI on SDS-PAGE under reducing (R) condition. The gel was stained overnight with Coomassie Blue. The purity of the protein is greater than 90%. Tissue factor pathway inhibitor (TFPI) is also known as Extrinsic pathway inhibitor (EPI), Lipoprotein - associated coagulation inhibitor (LACI), is a plasma proteinase inhibitor synthesized by vascular endothelial cells and part of it is associated with glycosaminoglycans of these cells. TFPI is a single-chain polypeptide which can reversibly inhibit Factor Xa (Xa) and Thrombin (Factor IIa). TFPI is a secreted protein with a N­terminal acidic region, three Kunitz (K) domains separated with by two linker regions, and a C­terminal basic region. The first K domain inhibits coagulation factor VIIa complexed to tissue factor (TF); The second K domain inhibits factor Xa; The third K domain binds to heparin; The C­terminal basic region may have several functions. For example, it plays an important role in binding of TFPI to cell surfaces. (1) Bajaj MS., et al., 2001, Thromb Haemost., 86:959. (2) Mine S., et al., 2002, Biochemistry, 41:78. (3) Witt I., et al., 2002, Hamostaseologie, 22:30–35.